This easy fitment wheel has been designed to fit across all Porsche models fitted with ABS as a direct fitment, 944S2, 928, 964, 965 and 993 through to Boxster and 996. The Veloce range of wheels are 3 piece "look" meaning they are Monobloc Wheels which appear to be "true 3 Piece wheels". The appearance is further enhanced by using full bolts on the "split rim". They also take the O.E. Porsche size center caps. Free fitting of wheel & tyre packages at the Brackley Performance & Service Centre. Price is for 4 wheels. Sizes 8" x 18 front, 9.5" x 18 rear. Fantastic looks at a low, low price! Click here to view a larger picture. As these wheels are 3 piece look, you won’t experience the problems associated with the original designs they were based on. No more corroding rims and bolts. 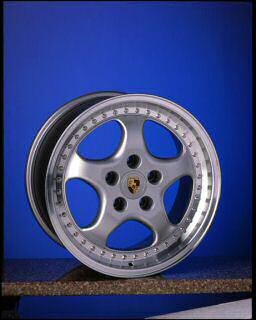 These wheels will continue to look factory fresh for many years to come and really suit the majority of Porsche models. Wheels can be seen at the Brackley Performance & Service Centre - packages in stock for immediate fitment. Delivery Time: UK Next Day Delivery (sorry, item currently NOT in stock). Price does not include delivery.